Mix water, peanut butter, sugar, soy sauce, cornstarch, gingerroot and onions in medium bowl; set aside. Spray 4-quart Dutch oven with cooking spray; heat over medium-high heat. Cook cauliflowerets, broccoli, carrots and celery in Dutch oven 5 minutes, stirring frequently. Stir in bean sprouts and water chestnuts. Cook 3 minutes, stirring frequently. Reduce heat to medium; stir in peanut butter mixture. Cover and cook about 5 minutes, stirring occasionally, until sauce is thickened. Serve vegetable mixture over noodles. Sprinkle with peanuts. You can use 1 can (14 to 16 ounces) bean sprouts, rinsed and drained, instead of the fresh bean sprouts. 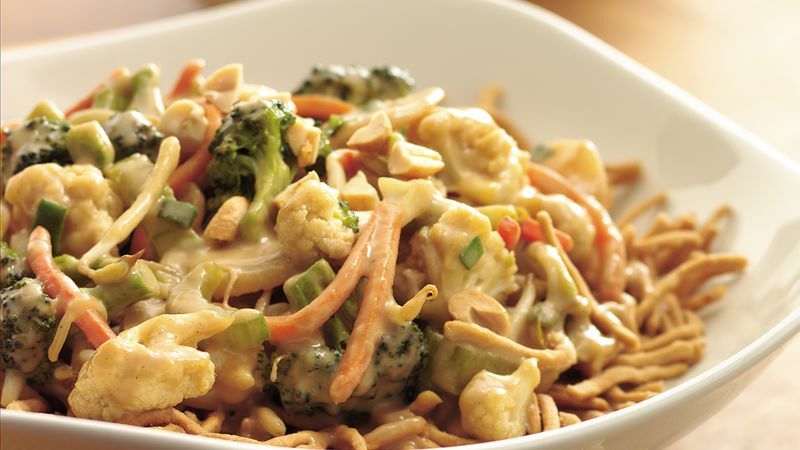 Purchase a prepared peanut sauce instead of making your own. Use 2 1/2 cups of peanut sauce for this recipe. Matchstick-size or julienne carrots can be purchased in the produce section of the supermarket.